At least 11 people were killed and 30 injured when a Hyderabad-bound bus fell into a canal after hitting a divider on National Highway-64 in Krishna district of Andhra Pradesh early Tuesday. 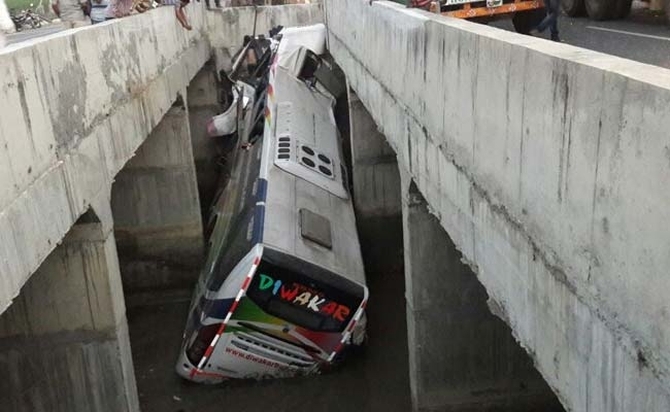 The private Volvo bus with 44 persons on board was on its way to Hyderabad from Bhubaneswar when the mishap occurred between two culverts on the highway, police said. The passengers were asleep during the accident. The bus driver, who was also killed in the mishap, was drowsy and lost control over the vehicle, police said. Police were also investigating the duty status of the driver since it was a long distance trip and two drivers were supposed to be on duty. Over-speeding is also suspected to be one of the causes for the accident and a case has been registered against the bus operator, police said. Nandigama Deputy Superintendent of Police Umamaheswara Rao is supervising the investigation. The front portion of the bus was mangled and gas cutters had to be used to rip it open and extricate the bodies. Two cranes were also used to lift the bus from the canal. Transport Minister Sidda Raghava Rao has ordered an inquiry into the mishap. While nine persons, including driver Adinarayana Reddy were killed on the spot, one passenger died in a hospital at Nandigama while another died while being taken to Vijayawada. Krishna District Superintendent of Police Vijaya Kumar rushed to Mullapadu to oversee rescue and relief operations. After first aid, the injured passengers were shifted to two private hospitals in Gollapudi and Vijayawada. Chief Minister N Chandrababu Naidu and Deputy CM (Home) N China Rajappa have expressed grief over the accident. Six of the deceased have been identified so far while efforts were on to identify the rest using the reservation chart. Most of the victims belonged to Srikakulam, Visakhapatnam and Vijayawada.